A ceramic tile countertop can be one of the most creative and unique types of countertops available for homeowner's today. The appearance of the countertop can be any color or design that the homeowner desires and can be easily repaired if any of the ceramic tiles become cracked or broken from use. Many homeowners would like to showcase their ceramic tile countertop in the best way possible and this often includes adding an attractive backsplash to the ceramic tile countertop. Most countertop designs have a small backsplash area built into the design because backsplashes are very important when using a countertop. The backsplashes prevent water and cleaning solutions from accumulating behind the countertop when the countertop is being cleaned, prevents other liquids from collecting behind the countertop where they could result in mold or bacteria growth, and makes the wall behind the countertop easier to clean if items are splashed or flicked onto the wall during meal preparations. Typically, a ceramic tile backsplash is made from the same tiles as the countertop, but recent new design ideas are providing new options for creating the backsplash. When it comes to creating a ceramic tile countertop backsplash, many people believe that bigger is better. They like for the backsplash to extend six inches or more above the top of the countertop to further reduce the risk of any food items or liquids slipping behind the countertop where it will be hard to reach and even harder to clean. Some people that have low hanging cabinets in their kitchen choose to extend the backsplash area from the top of the countertop to the bottom of the cabinet, covering the entire area with tiles. Larger backsplashes can be made more attractive by incorporating a pattern into the design of the backsplash. For example, if the ceramic tile countertop is black, then the backsplash could have an alternating pattern of black and white tiles to make the backsplash more appealing while still complementing the ceramic tile countertop. 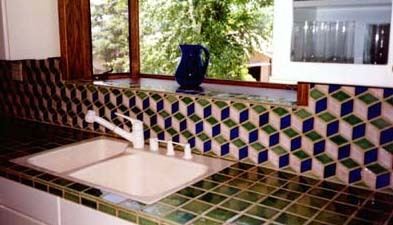 For colored ceramic tile countertops, the pattern used can be anything that the homeowner can imagine and the more creative the idea, the more unique the design of the kitchen area will look. Another way to create an attractive backsplash for a ceramic tile countertop is to use a contrasting color for the backsplash design. The contrasting color should contrast will both the countertop and the wall color or cabinet color that will be above it, effectively creating a bold line around the center of the kitchen area and drawing attention to the countertop. There are numerous ways to design a backsplash for a ceramic tile countertop that will be both attractive and unique, but the style chosen will depend on the personal preference of the homeowner and the décor that is already in the kitchen area.